Royal Plastic Music Group: Summer Season 2019: New Dates! We continue adding dates to a summer that nobody will forget! 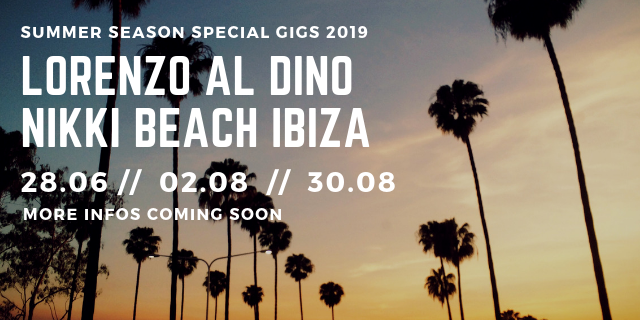 Lorenzo al Dino will be playing the soundtrack to your summer days on June 28th, August 2nd and 30th (with more dates still to be confirmed) at the famous Nikki Beach Ibiza. Nikki Beach Ibiza sits on a magnificent beachfront property and consists of a beach club and restaurant. Cabanas, cocktails, bronzed bodies and a abundance of glamour, mellow afternoons meander into high-energy evenings.